Depth: 7m / 20 feet. Features: Multiple delicate formations and animal skeletons. 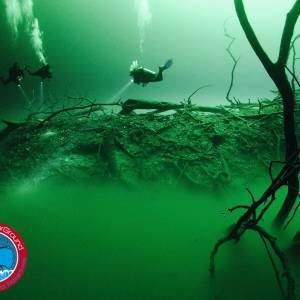 Pet Cemetery Cenote is part of the Sac Actun System, sometimes also spelt Sac Aktun, means “White Cave System” in Maya. The road to Pet Cemetery, shares the same entrance to Cenote Dos Ojos. Located about 33 kms from Puerto Aventuras. Driving along the Federal Highway, we turn off at the entrance for Dos Ojos and continue into the jungle, passing The Pit. 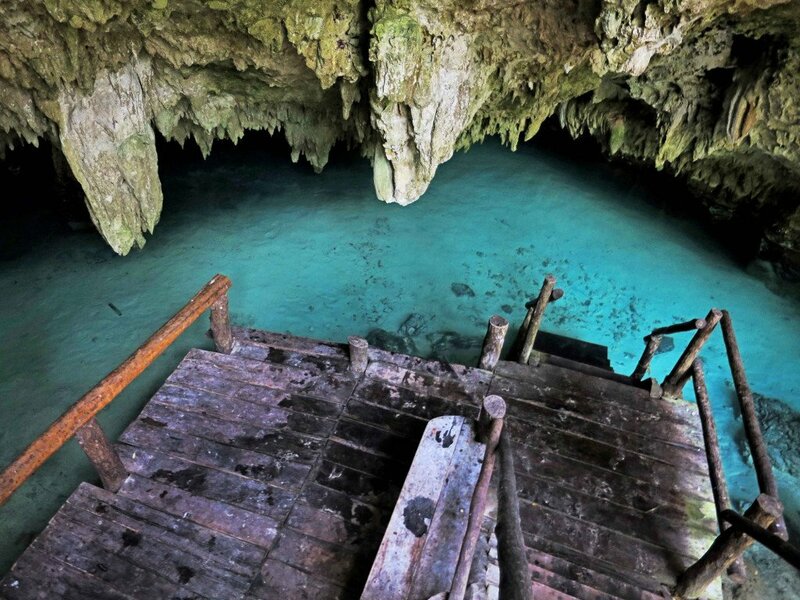 The access to this remote Cenote is about a 7km on a dirt road from the highway, but worth every bump! Pet Cemetery was given its name because of the ancient animal skeletons found by the cave divers who discovered this magical place. There is still the lower jaw bone of a tapir and the fossilized remains of a prehistoric camel! The grounds are very well kept by the land owners and there is plenty of parking and bathrooms. 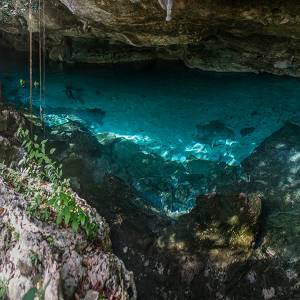 It currently holds the title of longest underwater cave system in the Quintana Roo Speleological Survey in the world. Including connected dry caves the Sac Aktun system is the longest cave in Mexico and the second longest worldwide. 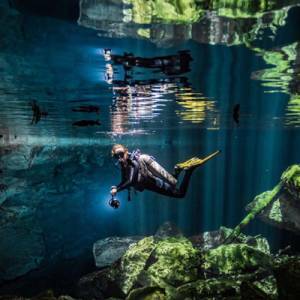 Pet Cemetery is one of the most challenging Cenotes to dive and has recently changed its rules to allow only Full Cave divers. 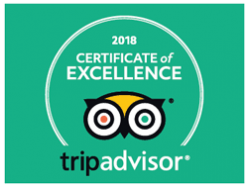 Being one of the most decorated caverns of all means that you have to have excellent buoyancy skills and awareness to avoid damaging any of the very fragile formations, the depths are extremely shallow and there is low natural light. 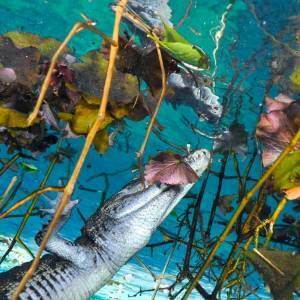 The maximum depth is 6 meters, but the shallow parts have a depth of 1 meter, making the dive quite tricky. 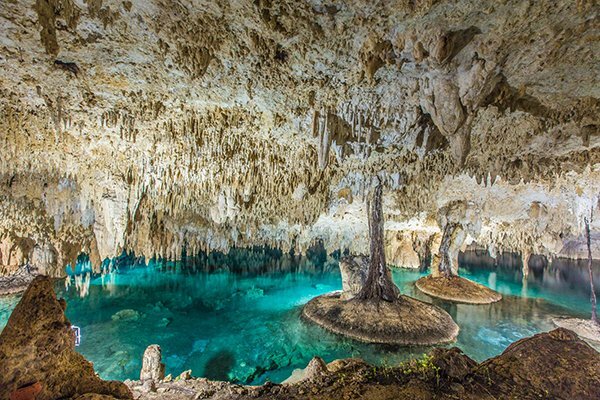 As part of the Sac Aktun system, the signature white sediments, walls and formations, enhanced by the amazing reflections of the water’s surface. The dive winds around the Cavern zone past a solution chimney entrance with a wooden platform that is used by snorkelers. There is not much natural light and can be quite dark in some places, but the light from your dive torch seems to makes this underwater crystal palace glow!!! There are thousands of white marble colored stalactites of different shapes and sizes, some even growing horizontally! Pet Cemetery will take your breath away!